Do you work for Google Surveys? Learning about Google Surveys? We can help. "Great service that is easy to navigate and use!" Google Surveys has been helpful for our STEM department in order to send out quick surveys for our students in the STEM program. We're able to collect data and responses easily! Overall, Google Surveys is an important tool and definitely gave our program a huge boost. So far we have no complaints with this service! Everything has been a smooth process. It can be a bit expensive per survey, but it is worth it in the long run! If you're looking to gather data and responses in a quick and easy manner, Google Surveys is the right program. Our team is extremely happy with Google Surveys! With data collection being simple and easy, we're able to prepare plans and ideas for our students' needs, and are able to respond to any criticism provided from our surveys. Our program has improved and have made necessary changed based on our responses. Our team tends to go back to our results for reference when preparing for the next semester. "Essential software for the fulfillment of my labor obligations." My current position at work requires that, as a sociologist, I use all the methodological elements necessary to develop sociological investigations of the communities I visit. Within the different ways of approaching the social fact, there is a methodology that surpasses other ways of approaching the perception of communities and is the analysis of information through surveys. In order to speed up the elaboration of the surveys that I am going to apply to the citizens, I use Google Survey; thanks to this software I can gather information quickly through forms where I pose the necessary questions to collect the community information that I need to analyze and thus fulfill my work goals. One of the interesting aspects of this software and that characterizes all the software's of the company Google, is that I can use Google Survey accessing from my email Gmail, that is, that I take advantage of this resource, since much of the information, questions and variables that I build for the preparation of the surveys that I have stored in my mail or in the cloud, therefore, it is very easy for me to extract the information and use it in Google Survey. In addition to these benefits and something that becomes common in Google's software, is that Google Survey has a very simple interface and easy to use, which makes anyone without much knowledge in computers can use it, also has some good options that allow you to customize the form to their tastes and demands. A software that has excellent performance and facilitates much the work of developing surveys to be used in research, however it is important that Google is concerned about strengthening the security of passwords because many Gmail emails have been pirated and the information is stolen or damaged, generating great discomfort in some of the colleagues that I have seen that this has happened. I believe that the failure of this software lies in the security of passwords, so it is important to use other software that can reinforce the password with which you access Google Survey. In the field of social and community research, it is important to use different methodological tools to collect information from clients or citizens, which serve as inputs to analyze the different variables generated by the testimonies of the people surveyed. If this is your objective, you should have Google Survey at hand, and you will notice how it saves time in the production and analysis of the surveys you should apply. Doing the surveys manually is one of the most cumbersome and tiring tasks I have ever had to do. However, since I learned all the functions of Google Survey and how this influences my work, I have managed to estimate that my productivity has increased by 60%, saving a lot of work time that I dedicate to other functions that are part of my work assignments. A software that I value a lot and on which I depend a lot to carry out surveys in my work. "Best way to find out the feedback"
It is helping to gather customer's fed back very easily. And Also, it is not difficult to understand. Anybody can fill it up, and express their comments through this survey method. It will clearly bring the idea of customers. So that, it is really help to improve the quality as per customers' need. It is making good bridge within customers and suppliers. And also, it is indirectly support to increase the profit of the business. This is a good method to gather the customers' needs and wants. But, there are noway to save the results in the system. I think that, it is a disadvantage in this system. So, if we have a facility to save the database in this method, we no need to record those details manually. So, if there is a facility available in this survey method, it will be a great platform to gather the data from the customers. And also, I do not know that, this system, is how much of secure to share the comments. Because, when we do the survey. we will ask some personal question from customers to categorize. So those details should be in safe. So, we have to prevent, from hackers. So, better consider on this matter, when the system upgrade. This is a valuable survey method to increase profit level for your business. And, it is ease to gather details with simple basic knowledge. No need to have a professional to handle this survey. We able to maintain the very good data base regarding customers' need and wants' without step down from the office premises. So, it is a time saving survey method. So that, we able to allocate more time time develop our business towards profits. 1) The blackbox that is where the info is collected. Because of it, you can't assess the potential bias of the data collection platform. What if 80% of the answers are collected on the same newspaper paywall? Wouldn't it influence results?. This is the reason I'm looking for alternatives now. 2) The ridiculous price cliff between a survey with 1 question and 2 questions, usually price x10 !!! And then 3 questions = 2 questions price. I would introduce a more gradual pricing, or at least allow 2 questions for that price. 3) The pay as you go downside is that once you start using it regularly, it becomes an annoyance to deal with credit cards payments in the accounting. When trying to get moved to invoicing, sales either don't answer or send you to a third party provider if you spend more than 3000$/month, but that didn't work out either. Cumbersome! 4) The very minimum customer support. Available only during PST working hours. I guess the rest of the world can go to hell for all they care. I wouldn't base any critical business decision on these surveys until the collection platform details are provided for each respondent (as in, the actual URL data was collected on). We're checking brand awareness with 1 simple question "are you aware of...?" We're also running a separate 1 question survey (because cost of 2 questions survey is x10 compared to running two separate 1 question surveys). Benefits are that we obtain cheap monthly data compared to a full on brand tracker. "Ease of Google Survey Use"
At my institution, we perform surveys fairly often and require a large number of responses to these surveys. The best part of Google Surveys is the ease of understanding on the end of the survey taker. We've really appreciated how easy it is to take AND make surveys. To be entirely honest, Google Surveys is incredibly easy to use and I have no issues with survey taking or development. There hasn't been a single thing come up that I dislike. Google Surveys is significantly easier to use. Most of us are using Google products anyways, so why not just transition as much as possible into the Google suite of services. It's significantly easier to use than SurveyMonkey, among other products I've been exposed to. Qualtrics is another service we've used to collect similar information but this is far better. We use Google Surveys for a variety of things within my institution. First, we use it heavily to get preferences on fundraising items. This is great because it's a quick and easy solution to have individuals anonymously state their preference. Secondly, we use Google Surveys to decide on professional speaker series dates. This helps us identify what the preferred days are for maximum attendance to an event. Lastly, we use this as an anonymous way to identify feelings about previous meetings. "Good tool for consulting the market"
Google Survey is a very good tool and the excellent truth in your area, it has many things that I like, but the main ones are: it is a very easy tool to use, besides how easy it is to collect information with it, we can have the same surveys, but we will have the same results and we will have different graphics at hand that will make the results more visual. I think it's excellent how simple the interface is besides Google. Surveys integrates very well with Google spreadsheets so you can extract the necessary information and, finally, I love how easy it is to get the survey to the population we want. Regarding the negative, I do not like the cost of the surveys, since it depends on the number of questions and the number of people we expect to answer. It is an excellent survey tool, but it is impossible not to take into account that there are more economic alternatives in the market that allow us similar results. With Google Surveys I have solved certain problems and it has been a great help for the consultation of a public itself, I feel that Google Surveys allows you to make surveys that are aimed at older audiences unlike Google Forms which is usually more personal and a group more selective of people. But we must also take into account how expensive it is to conduct a survey in this tool, which does not offer a free mode. "Great to 'gut check' an idea outside your customers / company"
Want to know how well known your brand name is vs. a competitor? Entering a new market and want to know if a product name makes Want to test one piece of creative over another? Curious how a given demographic uses a technology? Google Survey's is a great tool to address all of these questions and more. Much more inexpensive than doing a formal customer panel survey, and quicker to get results. While it is fast and affordable, I sometimes question the accuracy for super important questions. Definitely good for a quick gut check on things. It's easy and cheap to get setup. Try it out when you next find yourself looking for customer insights to gauge if it's right for you. Whenever we need to understand a deeper insight about a demographic - or - we wanted to test out a marketing assumption, Google Survey's has helped. "One of the best Survey Apps ever!!" It is really so easy to use and create the Surveys. The system allows you to automatically feed you answers as well. It allows you to copy similar questions and Surveys as well. I really enjoy using the Google Surveys Application. I find it easy to use, and without much training - it is all very self-explanatory, and if I do want specific training, I can easily find it on YouTube. I enjoy watching the videos and learning. I have even experienced with add-ons and other special features - it is super easy to use and I find my needs being met - for free for the most part! "Nice, easy to use platform." I like how easy and intuitive it is. I really enjoy how advertising it to users is built in, and you don't need to find your own ways to connect with responders. I didn't see where exactly it will be advertised. I later recalled the product on the user side, but most people may not be familiar with that. That's definitely not a deal breaker, but it may help the client to feel more at ease about their decision to use this product in particular. I will definitely look into the effectiveness of this product, because the ease of use and potentil time saving seems substantial. I think I will conduct few surveys to determine appropriate pricing before an upcoming product launch. I conduct UX research as well, and I can't wait to see how cost effective this survey product can be. "Google Surveys Review—Makes Life Easier "
I love that I have been able to turn messy forms for families into easy-to-read surveys to collect information. The data is easy to look at and I can easily find what I am looking for. Families like these better than paper forms too. What I dislike about Google Surveys is that I cannot turn it into the style of format that I would like to. Sometimes, is like it to look like a real one sheet document or be able to add graphics or video. It is a great and easy tool for education! I have not had many business problems; I simply choose a different tool if Google Survey can’t do what I want it to do. The benefits are less paperwork to sort, easier data collection, and simple sharing and exporting of data. It was super easy to use when I used it for school classes. I've used the service at least 10 times for my college speech class or for monitoring how much the clients like our products at the company I work for. The service is really easy to use and gives a lot of personalization options when making the survey, as you can even include images and charts! My only dislike would be that the surveys often come out very plain looking. There are preset themes that they give us the option to use, and the ones that I use are very simple. However, this can be a good thing as well since simplicity makes it easier for customers to use. It makes surveying customer's feelings and opinions very easy! I enjoy the service a lot. "Una forma rápida y eficaz de hacer encuestas"
Lo mejor de esta herramienta es la facilidad y comodidad a la hora de crear encuestas. Con una interfaz sencilla y rápida puedes crear encuestas tiop test, de respuesta libre, de rangos, etc. Además, te ofrece un análisis automático de los datos recopilados por la encuesta. Lo peor de esta herramienta puede ser la poca personalización que ofrece respecto al fondo de la encuesta, tipo de letras, etc. Además, el análisis de las preguntas es un poco limitado y si necesitas un mayor análisis tendrás que descargar el fichero Excel y hacerlo por tu cuenta, algo que no todo el mundo sabe hacer. Recomiendo este programa, ya que es útil, fácil y rápido de usar. Si necesitas hacer una encuesta sencilla, esta herramienta te facilitará el trabajo sin la necesidad de realizar un gran esfuerzo y sin necesidad de programas complicados que, en ocasiones, suelen ser de pago. Esta herramienta gratuita ofrece todo lo que neceitas para realizar un trabajo correcto y bien presentado. Además, al ser un producto de una gran compañía como lo es Google, tiene detrás un equipo de sorporte capaz de solucionar cualquier tipo de dudas en muy poco tiempo. Con esta herramienta el principal problema que se resuelve a la hora de hacer y divulgar las encuestas es precisamente la capacidad que ofrece para compartir vía redes sociales y llegar así a un gran número de encuestados. Además, al ofrecerye una interfaz ya definida te ahorras tener que hacer el modelo de encuesta desde cero con otros proggramas como por ejemplo Word. The surveys are easy to set up and customize. I like the ability to get real time data and graphs for some answers. There are some limitations as to what kind of structure for the questions. Not all the analytics come out easy to read in the graphs but can download to excel and look at it there. I don't like the cost. It's easier to send out surveys via forms which is free. There is definitely a cost factor to think about, especially if doing a lot of surveys. We've used the surveys for looking for training needs for across the state, sent out instructor surveys when new information came available for them. Get out quickly and people can complete them on their phones. "Good Product with reliable features"
I like the accuracy of google surveys and the convenience of creating multiple surveys that meet your needs. was very easy to set up and had no technical issues. Could be easily done on a mobile device for convenience. "Google Surveys is simple and easy to use"
GSuite has become such an integral part of my business - having it all link together with surveys and other functionalities allows for increased productivity. I dislike the lack of visual/theme customization - I would like to create more aesthetically-pleasing surveys and Google does not really cut it in terms of cleanliness and being modern in appearance. 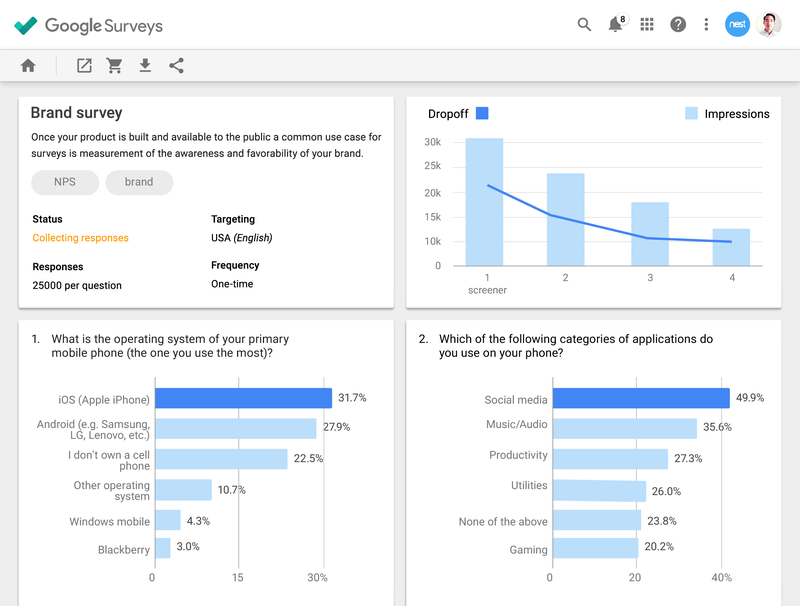 Overall, Google Surveys is a great way to create effective surveys with many capabilities that allow you to easily analyze the data. 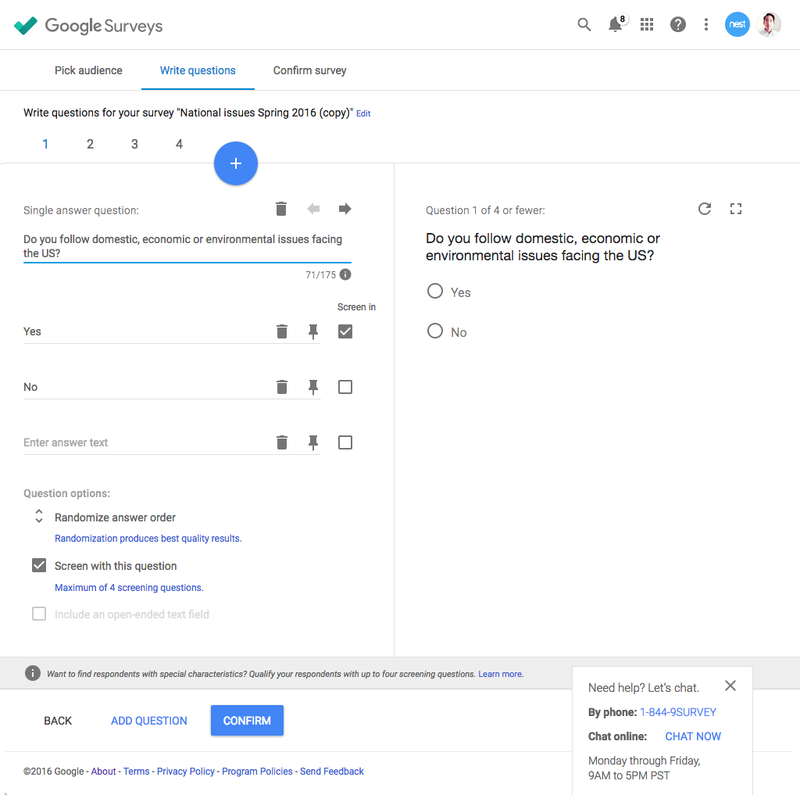 The only thing I wish Google Surveys had was the option to create custom themes - maybe this is available but I am oblivious to it or it is very difficult to do. We are looking to determine the best ways to market to those looking for entertainment and photography services. Surveys have allowed us to target specific client groups and increase the number of quote requests and overall revenue. It is free and easy to use. Results come back in a spreadsheet, so you can add visualizations in Google Sheets or Excel. The are lots of add-ons which greatly improved on the power and value of the survey form. You can tell an engineer was in charge of the UI/UX because it is very bare bones with virtually no way to make it look pretty though you can add images and video. This is pretty bare bones but if you're using the other Google tools like Docs, Sheets, etc, then this a good solution. I use it to poll members at my Meetup.com groups and in communities at LinkedIn. It is super fast and easy to do a short survey with a couple topical questions. "Google Surveys enables quick and well-managed surveys. " Using google surveys, it is really easy to design a new survey . Everything is readily available from templates to designs, from contents to publishing and sharing schemes. Each and survey can be designed as per the way we want it to be. From choosing specific categories to distributing it among specified group of workers , all of these is easily sorted by google surveys. These surveys provides only basic and straight forward information regarding the surveys but we often required a deep insight to the surveys which this google surveys often lacks. Google Surveys are very efficient and are manageable as per the way we want it to be. Google surveys helped us to arrange the inner organization surveys through which we are more able to look in the insights and opinions from our employees. "Simple, easy to use and already integrated with the G suite"
I like that surveys are already linked with my google account and that of my company. We use them to gather information from staff internally but also for survey data externally. I wish I could change the size of the header above the survey. It's an awkward size. I don't dislike anything about the specific product though. Use the different question type function for more specific results and reports. Google Surveys makes it easy to gather and analyze information. Links are accessible with whomever they are shared with and users don't have to create accounts or log in to a separate program. A benefit of this product is streamlined data-gathering. Spreadsheets with data are automatically created and charts are auto-populated. "Tackling the hard question. Like pizza." The ease of use and different options I have available to make my surveys and forms. There really isn't anything I dislike about it. It's simple to use and makes everything easy for me. If you feel a survey would be beneficial to your team for even the smallest of things then give it a shot. Make sure everyone is on board and they know to look out for notifications. When everyone is on board it works out great. The benefits for us are pretty simple. We have a decent amount of people that are going in and out of our branch so it's hard to get everyone together at once. With surveys, we can easily ask the important questions like, "what food do we want for team meetings?" Since we can push it out to everyone's e-mail we can expect quick responses so we can plan accordingly. "The best service for your surveys"
Google Surveys is the best service for your surveys (or is what I consider the best). I like the fact that I can set my questions asking for a free answer, multiple choices, checkboxes and even images and pictures. The inisght part is also very good, you can see and analyze the datas in the platform or you can export them and analyze outside. Would be great to have a basic template to form the survey, instead of making it piece by piece. Google Surveys, as far as I experienced, is one of the best survey service on the market at the moment. Google Surveys is what I need when studying and working on a new project, having the needs to understand how a segment of the audience perceive certain thing. In the past others in our industry will take a lot of people in a room to understand this, now thanks to Google Surveys I can simply send out a link and wait some minutes for the reply. So it helps to save my staff time, organize anc collect the datas, and finally analyze them (all of this in one single platform). "Simply the Best Surveys online." I love the semplicity of use, the support behind the service, the portability of service: You can access it from anywhere you are. In train, in bus, while you drink your coffee in a bar or just before going sleep! It's totally free. I also really like the way the results of the surveys are showed: in a graph and pie charts. - More types of question types. - A dedicated support / help center. - The possibility to track who responds to survey. There are on internet, a lot of survey services. Try the one you most like, but i can assure that Google Surveys it's the simplest and most effective service of surveys you can find. And last but not least, who doesn't have a google account nowadays? "Good way to keep in touch with ideas and feedback from clients and focus groups"
I like that is a simple platform and ready to use site. Google Surveys also allow to have anonymous reply to the surveys, so there is a bit of comfort in doing them for clients. A bit more of customization would be great, but I've nothing too big to regret about Google Surveys. On the internet you can find a lot of surveys service. I can only say you to find out and use the one that fit your work flow and style. But, I can guaratee you, Google Surveys is a great way to narrow down your energy on surveys and quickly and effectively use them. Google Surveys helps me to stay in touch with ideas and feedbacks from clients. I also use it (and it is a God tool) in focus groups for my projects. So I do not have to gather all the people in a room in my office, I only have to send them an email Great, great, great way to use it. "Easy to use interface for creating, sharing and managing surveys"
I like that everything is linked to my Google account and I can use that one sign in to access my surveys as well. Google Surveys makes it easy to create and share powerful surveys and then organize the results in easy to digest ways. I wish there were easier ways to input graphics, but other than that I am very happy using Google Surveys. Great option if you want to create easy to use and organize surveys to share with colleagues and employees. The ability to sort through responses and organize polls and surveys based on responses is very intuitive. The ability to create powerful surveys and polls for free and instantly share them to colleagues. Google Surveys offers a simple approach to gathering information. It has provided me with a free, user-friendly route to better organize information gathered at a quick pace from all my collaborators. The only thing I disliked was that I got a couple of double responses from people. I wish I could limit it t once per email. This would make it easier to also monitor who has and has not responded to the survey. We are solving tasks that require multiple peoples' input. For example, we are able to quickly make decisions where I need a consensus from all my colleagues such as what improvements we want to incorporate a limited amount of company funds. "Convenient and user friendly "
Google surveys are extremely easy and quick to set up. you can easily train others as well because the interface is very intuitive. Great product for non-tech-savvy individuals and those in school. Easily able to collect information and data for research or reporting. Although Google surveys is very easy to use and set up it lacks in its ability to add certain features. You have the most basic functions and can't really defer from the options provided. I understand the need to keep things simplified especially when thinking about ROI on surveys but sometimes I want to add more complex questions. Also the reporting of data isn't the greatest. Only simple views of results. Keep it simple. Don't try to overcomplicate your surveys. Research and experience. We use google surveys to gather information from our teams on how we can improve as a whole. We also use it in order to better the experience those have with our team. We want to ensure we are always providing the best support and using surveys is a quick and easy solution in order to gather this information. Nothing really. It's easy to access and use so I have no complaints! Definitely use this! It's easy to access all of your old surveys and easy to create new ones. I always make a basic one and then update the questions when I need a new one and save it as a new survey. The pricing is pretty good especially if you're trying to reach a large audience. You can customize your audience type as well by age, gender, and location (region, state, etc.). We use surveys a lot to get input and information from our tenants. We are able to figure out what kinds of events they want, any issues or complaints they have, etc. etc. "I have used Google Surveys several times, and have had pretty positive experiences." I like the customization and functionality of Google Surveys. There is a large variety for options of how you want to word your questions - dropdowns, check boxes, fill in the blank, etc. As a user, it's also convenient to be able to track easily how many responses you've acquired, as the results are on the same page as the form itself. I also enjoy that on the responses page, the results are shown in graph options. This is very nice for reviewing the data in different formats. I think something interesting Google surveys could do to improve is make the responses live, so the administrator can track the results live instead of refreshing the page to monitor new responses on the form. I also think that, even though the results are shown in bar graphs, the results could also be shown in different graph formats, such as pie graphs, line graphs, scatter plot, etc., of course depending on the type of question and results, depending on if the question/answer combination would benefit from a different type of graph. I think this could take Google Surveys to the next level by displaying not only the results, but the results in several formats/graphs. I would recommend Google Surveys to those interested. It's a great platform that most people can use since so many people have email accounts associated with Google. 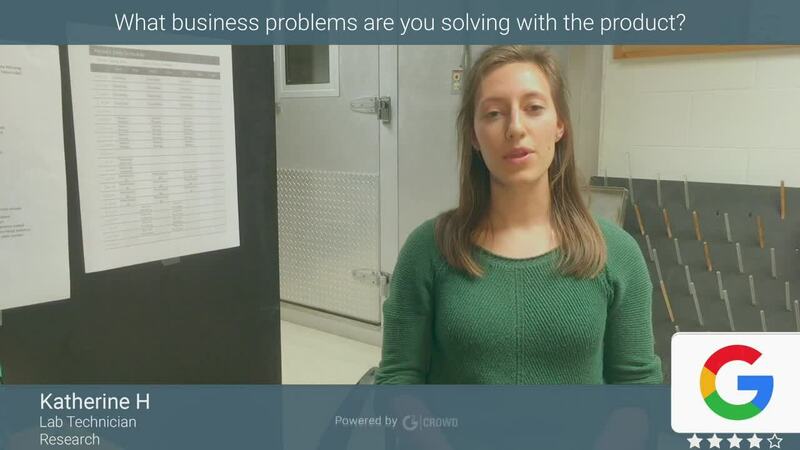 There are several options on question formats, and it gives you results in graphs that are easy to understand, and it generates both individual results and group results so you are better able to make sense of the data. We solve several problems using Google Surveys. Some of which are asking human resource questions, ranging anywhere from "How can we better the company?" to "In what ways do you feel our company is doing poorly?" This helps gather questions on how to increase employee happiness, but we also have used it to answer fun questions throughout each department. This has helped make certain departments closer since they are all taking part in something together, sometimes even competing on which result(s) they want. "Sophisticated platform provides an enjoyable experience for any size business "
With Google Surveys, I really enjoy how easy it is to become integrated with the platform. It's easy to understand and follow along. Furthermore, it allows for sophisticated analysis of the data, and provides an user-friendly experience. The data gathered is displayed in easy to understand manners, including visual aids, such as pie charts, graphs, and more. It really allows a business to go more in depth with gathering information about the customer base or anything else. The Problems with Google Surveys include the fact that the features are sometimes hidden. Because the platform is so streamlined, and the User Interface is clean and simple, it's difficult to locate some of the important features on Google Surveys. Which can be a problem for someone trying to add specific questions or features on their survey. Usually I will have to do a Google Search to find these features which ends of taking more time out of my day. Some of the business problems that I face with Google Surveys includes the hidden features that are hard to find. Because the platform is simple and clean in design, I will have to Google how to find the specific features. Which ends up taking more time. 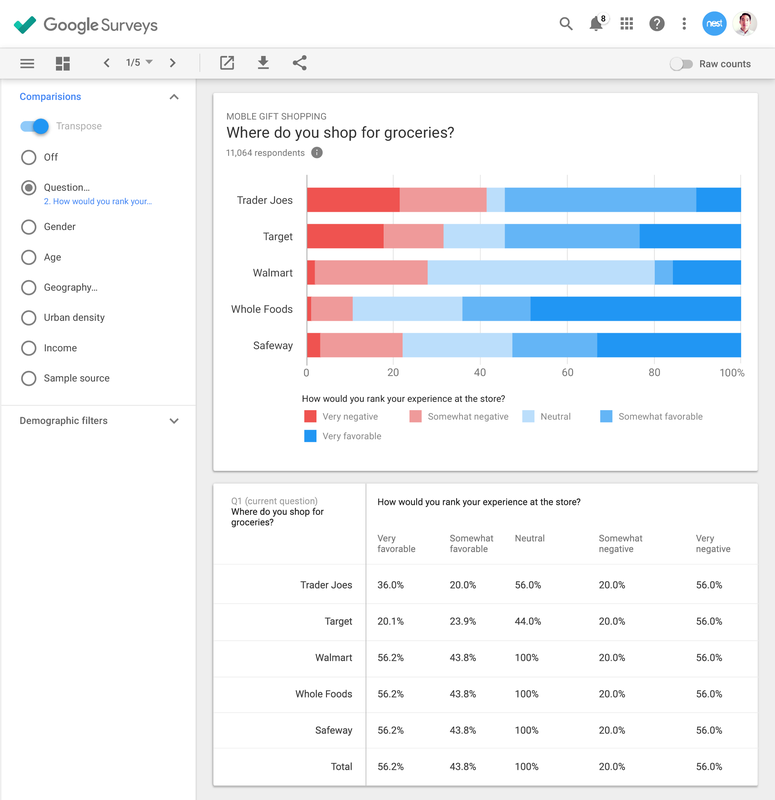 "Google Surveys - Understanding Your Customers"
It gives our company the opportunity of what the customer wants to seee or not see in our stores. By getting a thorough understanding of our customer allows us to compete and gain an advantage on our competitor retail stores. Retail is always evolving and changing, so having a feel and a pulse of what our customers like in our stores will help our designers accommodate their needs, which will ultimately lead to higher sales. There is not much to dislike with Google Forms. You can customize the formatting and questions of how you would like to see it. Maybe, if Google had a pretty cool background pictures to spice up the surveys a bit, so it would look more professional and not so boring looking. It absolutely helps the company gain better traction of what our customer expects and is looking for in our stores. The customer comes first and we will make sure she is 100% satisfied. "A quick and fast way to do surveys"
The interface is simple and easy to use, you can embed and videos, several types of replies options giving flexibility to both sides of the survey such as multiple choices including a grid format, true or false and short or long answers, the feature to see live responses, being able to transfer the information to another tool and well, it is free. It lacks some options when it comes to a custom design and you have to resize images in advance, but other than that there is nothing wrong with Google Surveys. It is a solid tool in overall. 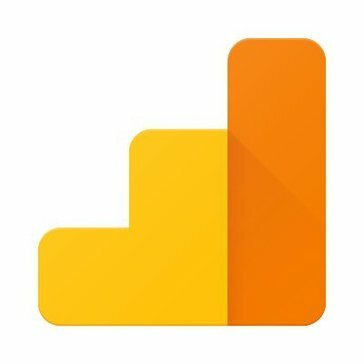 Google Survey is a quick tool to make surveys and easy to use, and considering it is free I would recommend this to anyone before trying a paid plan or alternative. Since it has integration with other Google Tools, you can easily host in on Google Drive and export the data to Google Sheets or any other variety of formats. I have used this software to make and reply surveys, as it allows to not only get data from external sources but also from the coworkers themselves, being for research or just feedback. I love Google Surveys! It is so user friendly and simple to use. Although I have only used it once, I don't see myself ever using any other software to design surveys again! I love how easy it is to share your survey with contacts in Google. It is also very easy to create the surveys and there are so many options as far as question types go. I love the fact that it is free to print and distribute the surveys, which makes it perfect for a grad student like me! I really don't dislike anything. I am a ChromeBook user, so any software involving Google is great for me. Very easy to use, no complaints! Highly recommend this! You have to try it at least once, it is so simple to use. We use Google Surveys to gather information from other students in our cohort. It is so simple to collect data as quickly as efficiently as possible...much easier than old fashioned paper surveys! "Great Usability, Aesthetics could Improve"
I like the customizability allowed with google surveys. It's easy to throw something together and I think is very competitive with things like Facebook for planning events. I also love how it's intuitive to use and you can just go directly to a survey that fits your needs- like RSVP-ing for an event. I think the design can be improved to be more visually appealing. For example, instead of having a plain background and a sliver of a photo at the top, there should be options that you can set the background for the entire survey, things like that I think make a big difference. I'd definitely recommend using Google Surveys. It's easy to use, intuitive, and gets the job done! One of the greatest benefits of Google Surveys is that almost everyone has a Google account so the platform is very smooth to operate across. I use Google Surveys when I need to collect information from a large base of individuals. I work in public health, so I'm often creating surveys to collect information and I love using Google Surveys! Google Surveys is my go-to method for polling a group of people. The forms are easy to fill out and customize to meet your group's needs, and completing the poll as a participant is equally as easy. The best part of Google Surveys is gathering the responses at the end, because Google Surveys consolidates the data into tables, charts, and graphics that make visualizing the information simple but powerful. Though the forms are easy to navigate because of their simplicity, they can come off as somewhat unprofessional due to the graphic design, including colors and font choices. Overall I am very pleased with the program, but it is something I notice when I complete the forms and distribute them in a work setting. This is a very convenient way to organize data from a large number of people. Because it is customization, it can be applied to numerous diverse settings. It is also very user-friendly, so all participants are able to complete the forms. 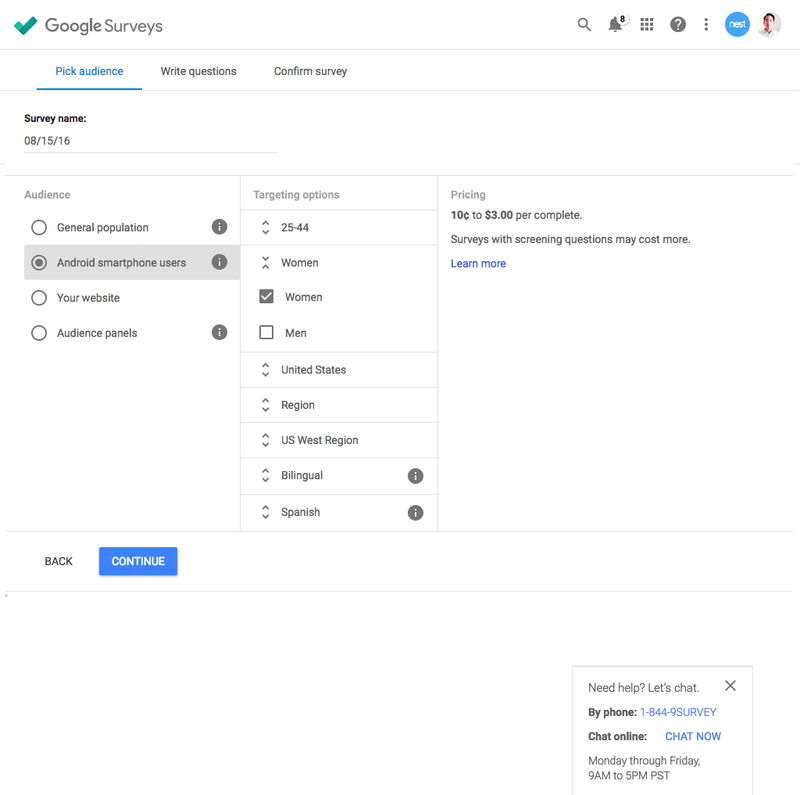 "Google Surveys is a must-use for planning the next actions of a business"
With Google Surveys it is sooo easy to customize the market research. The web interface that it provides allows you to create and design the survey as you want and even personalize it according to your costumers. The major disadvantage of this product is that it is not currently available in all counties but only in a few of them. Let's hope that this will change soon. With Google Surveys many problems of the business which i work for, have solved. Using it we know what the customers thing and what they want. So we are able to provide them with it, without losing money or working hours thinking what they might want.All due to Google Surveys. "Great Resource for Reaching Many Audiences"
I personally love that it has so many options for question format that way you can get what information you are looking for based on how the question is presented - having a matrix set up for more intricate answers so that we are able to narrow down where we need to be focusing resources and money for the students and parents for our demographic while giving the parents the chance to feel that their money is being used for the purpose of the students. Helps create more transparency in the system. Of course they offer to android audiences but they have not incorporated iPhone user audiences as far as mobile devices yet. I wish there was some way they could open that market because where and when I use this product, that would be very useful. Great program for receiving feedback as far as products and promotions for your business. Well in my place of business parent and student feedback is so important to us so to reach as many parents and students as possible, this is something that we utilize to make it happen.